I kindly received Safe & Sound: A Novel in exchange of an honest review by the author. Another day, another review. And again... I am so happy to cosider myself as a book blogger and receive such wonderful books like this one. If I knew how much I'll enjoy this book I had it picked it up much earlier! A beautiful debut novel by T.S. Krupa. Meet, Jill and Jay Greenfield. Their life is like out of the movies: perfect. Jill and Jay are meant to be. Both found their true love in each other. They are about to live their happy ever after: Get married, live in a wonderful house, having successful career and get kids one day. Unfortunately life has other plans for them. After Jay goes out for a morning run, Jill, wakes up to a horrible phone call. Jay’s been involved in a car accident that has left him braindead. The doctors are not able to rescue him. 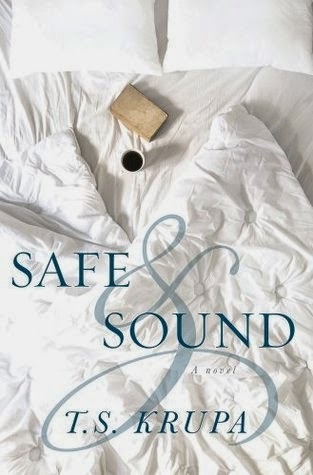 "Safe & Sound follows a yearlong journey of love, loss, friendship, and conquering the unexpected." That truly describes the book at it's best. Once I was in the sory it was very hard for me to put this book down. It was an emotional read straight from the start. Left me several goosebumbs, teary eyes, giggles and big smiles on my face. The thing I liked most about the book is that the story was so real. The characters so believable and easy to relate to. I can imagine how horrible Jill felt after this tragic loss. I lost too many loved ones in my life already. Stella was my favourite secondary character. Always guaranteed to make you chuckle. The most outsanding message in this book is.... have always hope. Safe & Sound is a must read for all romance fans. Highly remcommended read. I can't wait to read more of T.S. Krupa's work. This book sounds amazing, awesome review! Thank you very much! You should pop this on your TBR list.